Don’t miss your chance to win a FREE ENROLLMENT FEE! Work must be done by person entering, and all work must be appropriate for social media postings. Contest entries must be received April 27th, 2019. Please upload your best picture of Hair, Makeup and Nail work to the LJIC 2019 Instagram Contest. By clicking the SUBMIT button as my official signature, myself and my model (if used) both expressly give La’ James International College our consent to receive calls and/or text messages at the telephone number provided above, including my wireless number if provided. We understand that we may withdraw our consent at any time, and that our consent is not a condition of purchase. 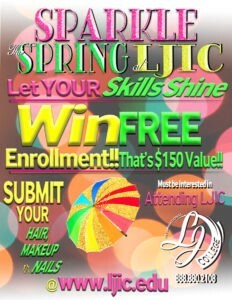 By clicking the SUBMIT button as my official signature, I myself and my model (if used), give permission to La' James International College to use our name(s) and uploaded photograph on its website or in other official La' James International College social media postings about the contest without further consideration.